Throughout popular culture, root canals get a bad rap. On the TV, you may have heard someone say, “I’d rather get a root canal” then endure some other kind of harrowing experience. The truth is that root canals aren’t really that bad. Patients often compare getting a root canal to receiving a filling. 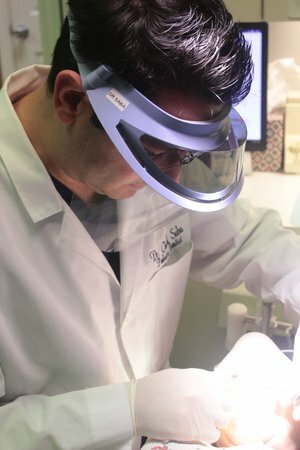 With cutting-edge technology and modern techniques, we can help you have a comfortable experience during your root canal treatment. We understand the stigma that accompanies root canals. If you’re still uneasy about getting a root canal, we offer several patient amenities and sedation dentistry options to help alleviate your fears. We will do everything we can to help you feel relaxed and comfortable during your procedure. A root canal is necessary when your dental pulp becomes infected. The pulp is the part of your teeth that houses nerves and blood vessels. It is located in your inner teeth. When the pulp becomes infected, it causes aches and pain because it is so close to the nerves, resulting in a throbbing toothache. Root canal treatment helps relieve you of your toothache by removing the infected tissue. Once the infected tissue is removed, your dentist will seal your tooth. Typically, a dental crown is placed atop the affected tooth to protect it from further decay and damage. At Echeverri Dental Center, we do root canals for single-rooted teeth, such as anterior and bicuspids. For molars, we will refer you to an excellent endodontist that can take care of all your endodontic needs. You no longer need to suffer with a toothache. If you’re interested in learning more about root canal treatment, contact our Houston, TX dental office. We would be happy to address any questions or concerns you may have. Call Echeverri Dental Center today to schedule your appointment!